Home design trends come and go, but classic style is one designers come back to again and again. When selecting your James Hardie® siding and trim—something that will likely stick around for years—you can feel confident knowing timeless design options abound. James Hardie’s range of siding and trim options puts you in the designer seat. 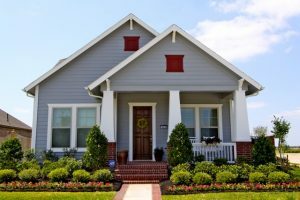 There’s lap siding, staggered or straight edge shingle siding, vertical siding and trim, all in various sizes and textures. And a vast ColorPlus® Technology palette of colors, created to complement one another. So no matter what palette you create for your exterior—from bold blues to rich reds to warm neutrals—you can feel confident knowing each one will coordinate. 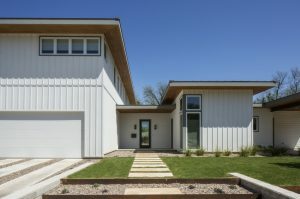 This pristine and clean modern beauty is clad in HardiePanel® vertical siding with HardieTrim® batten boards in Arctic White. Instead of opting for a monochromatic white trim, the homeowners selected a gray trim hue. We love how it makes the interesting doors and windows grab focus. This house just feels like home with HardiePlank® lap siding in soothing Boothbay Blue and HardieTrim® boards in Arctic White. The red accents feel like an updated spin on a more traditional look. This Midwest farmhouse is a piece of history preserved with durable, protective siding with timeless design. 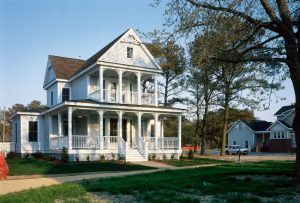 This classic home is clad in HardiePlank lap siding and HardieTrim boards both in Arctic White. For an updated look that you won’t grow tired of, design your home with the timeless style and lasting durability of James Hardie siding and trim.